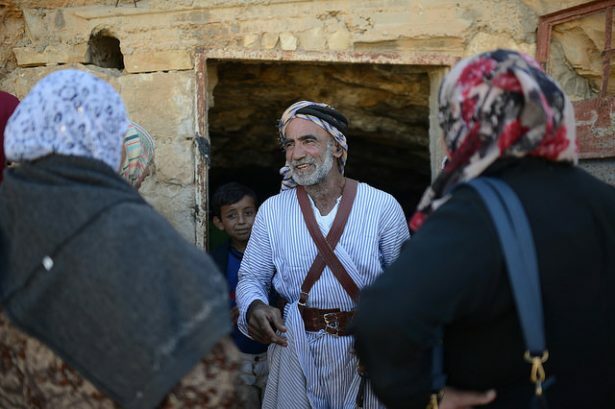 After being displaced 20 years ago, the Sumud Coalition helped Palestinian families from the West Bank village of Sarura move home and reclaim their land. 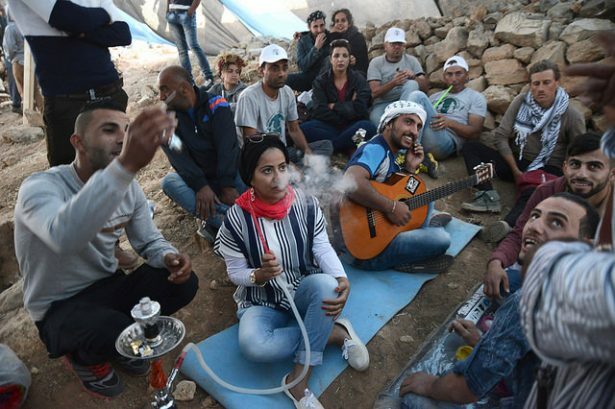 A new project in the rural hills of the West Bank, called Sumud: Freedom Camp, is the latest sign of a resurgence of strategic, nonviolent organizing in Palestine that is creating strong bonds between Palestinians and Jewish activists from Israel and around the world. 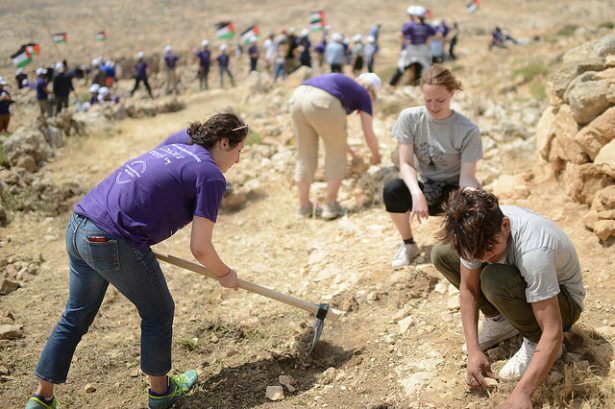 I traveled to Palestine in May with a delegation organized by the Center for Jewish Nonviolence, or CJNV, to help build Sumud, which means steadfastness, following a call by Palestinian communities. 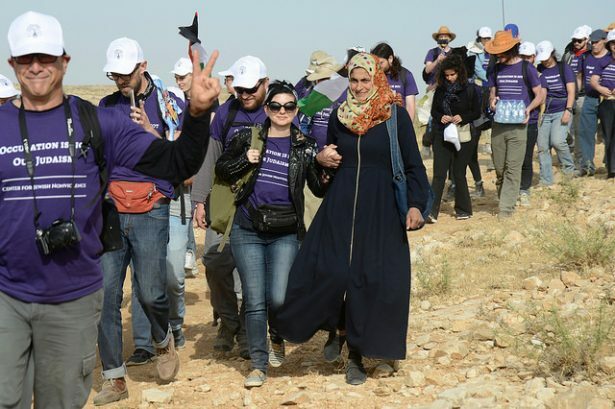 Using the hashtag #WeAreSumud, the camp was organized by an unique coalition of Palestinians, Israelis, Jews and international justice seekers standing in solidarity with the village of Sarura. The families of Sarura were displaced from their homes in the 1980s and 1990s, and want to return to their lands and sustain their homes, which they still legally own. The land of Sarura was declared a restricted military zone as part of Firing Zone 918, when 1,300 Bedouins were cleared out of a dozen hamlets south of Hebron, just north of the Israeli border. The residents have faced continuous settler violence and harassment including the poisoning of livestock and wells. After decades of injustice, marginalization and occupation, the Sumud Coalition is calling for an end to the systematic displacement of Palestinians, the dismantling of Firing Zone 918, and a future of justice, dignity, freedom and equality for all. On May 19, after walking to Sarura from nearby Al-Tuwani, Issa Amro of Hebron’s Youth Against Settlements welcomed everyone with a brief history of the area and a call to steadfast nonviolence. Fadal Aamer and his family have led this return to Sarura. We laid a concrete floor in Aamer’s family cave, which Israel evicted them from 20 years ago, and where they’ve lived since their return. We restored walking paths and paved a portion of road which helps reduce costs of supplying such outlying communities. We erected large tents over old stone-walled areas and danced exuberant, semi-traditional, Palestinian dabkah around a fire. People observed Shabbat in different ways as they saw fit. On the second night, a little before midnight, the Israeli army violently showed up and seized, illegally, Palestinian-owned tents, a generator and food, while also pouring water on sleeping gear and wrecking a projector. They pushed and pulled people as we created nonviolent walls by linking arms to hold or reclaim our space. While we were not able to block their vehicles from leaving with our supplies, it was clear that they were ordered to take things away, not people. The next night, Aamer’s oven made the first pita bread in Sarura in 20 years. The camp has persevered, despite the army taking more gear in subsequent incursions. They impounded a car owned by Aamer’s son and detained him. The coalition is raising money to replace items rather than pay exorbitant ransoms for their return. The second phase of the Sumud camp was to hold on at least through the holy month of Ramadan. International and local supporters worked days and vigiled all night. All That’s Left, an Israeli-based collective unequivocally opposed to the occupation and committed to building the diaspora angle of resistance, helped coordinate rides from Israel. Members of the popular committee of nearby Um Il-Kheir were key to keeping Sumud going through the nights of Ramadan. On June 26, there was a celebration in Sarura for Eid al Fitr, which marked the successful conclusion of this phase. Those with the CJNV delegation readily agreed to follow the direction of our group leaders like Isaac Kates-Rose and Palestinians like Issa Amro and Sami Awad of Holy Land Trust to leave interactions with settlers, military and police to them. During the night raid’s chaos, they simultaneously argued about our rights with the army in Hebrew, Arabic and English, joined and led chants, told us when to hold space and when to regroup, kept an amazing sense of humor and helped us find success, despite the partial destruction of our camp. A Palestinian-led steering committee — that includes partners like CJNV, Holy Land Trust, Combatants for Peace and others — was formed months in advance for Sumud and continues to map out a strategy going forward. International and Israeli Jews were asked to consciously apply the privilege granted to them by the oppressive state to get in its way. A vital feature of the Sumud effort is how it has brought together various “popular committees” from small, rural communities in the hills south of Hebron — which coordinate much of the activism and community engagement resisting the occupation — with more urban, nonviolent organizing groups like Holy Land Trust and Youth Against Settlements. After the 2016 delegation, some of the people and communities CJNV visited and worked with were quickly targeted by Israel and settler groups with extra-judicial demolitions and legal action. Nonetheless they have been very involved in the return to Sarura. Issa Amro, who is often referred to as “a Palestinian Gandhi,” was back in military court on July 9 over old, trumped-up charges filed shortly after a CJNV delegation in 2016. In the Occupied Territories, Palestinians are legally treated as guilty until proven innocent under a set of laws that apply only to them, not to Israeli citizens or internationals. Despite the 99.74 percent conviction rate of Palestinians in Israeli military courts, Amro’s case was extended until October for his next hearing. The people of Um Il-Kheir have suffered through two more rounds of demolitions since CJNV and local children painted a mural on the side of their soon-to-be destroyed community center. The third phase for Sumud will see a continuation of international support and attention, but less of a presence on the ground. New lines of communication were devised and strengthened for Sumud with the hope that they will continue to be helpful even if Israel re-evicts Palestinians from Sarura. Communities that are very close geographically have united around the current effort with renewed cohesion. Palestinians are steadfast in sharing mutual aid despite the various types of roadblocks put up by Israel and its hostile settlers. Unjust scrutiny and attack are already part of Palestinians’ daily life, and the coalition behind Sumud is encouraging internationals — and Jews in particular — to join them in their struggle on the ground. Jim Haber is a long-time social justice organizer from the San Francisco Bay Area, active on a wide range of issues. He has been a member of Jewish Voice for Peace since 2000. Jim was on the National Committee of the War Resisters League from 2002 to 2013 and the steering committee of World Beyond War from 2014 to 2016. He helped manage a San Francisco soup kitchen for over twenty years in the Mission. He helped pioneer the Prevention Point needle exchange program for HIV prevention during the 1990s. Jim is also a Certified Laughter Yoga Leader. There wasn’t one word here to explain why he was evicted 20 years ago. There was a whole paragraph about the evictions. It wasn’t he, it was 1300 Palestinians from 12 villages/hamlets. There was a link to a definition of “Firing Zone 198” which was created and used as the reason Fadal and the others were made to leave. Sharon, I think a more contextual response to your comment would take note that Israeli settlers have done everything they can to remove Palestinians from land they want to control for nearly 70 years. This specific family in this specific location have their specific reasons and history, but they need to be seen in the wider context of widespread, ongoing Israeli dispossession of Palestinians through various means with various rationales and justifications.